"Welcoming everyone to join our family and become an ambassador of Welsh male voice singing"
At this time of Remembrance in November 2018, we look back on the 4th August 2014, as choristers adorned their concert jacket lapels with suitably dated metallic ‘poppies’ in preparation for the Commemorative Tour of Concerts and Ceremonies in France and Belgium, honouring the sacrifices of the British Expeditionary Force 100 years before. CÔR MEIBION DE CYMRU has long been associated with Remembrance but will at this time pause to reflect on all of those who have passed through their ranks – both old soldiers and civilian veterans – singers one and all. We remember so many stalwarts, too many to name, apart from perhaps the most recent ‘Autumn Fallers’. A founder member and baritone Edryd Evans, Resolven Group Chairman and President of the Royal British Legion Branch. Then there’sCaerphilly born Second Tenor William ‘Billy’ Lewis, a REME and Suez veteran.Finally, CMDC Friends Secretary Keith Bishop who devoted his last days to the care of his ailing wife Hazel. Perhaps those lapel poppies need to continue to shine under natural or stage lights in the future. 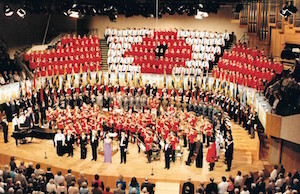 Photo – CMDC in the Poppy formation at the 1987 RBL Wales Festival of Remembrance, St. David’s Hall, Cardiff with the Regimental Band of the Coldstream Guards and Legion Standards.